Notice all of the beautiful lawns throughout Raeford, NC? They’re likely the work of Tarheel Lawn Service! 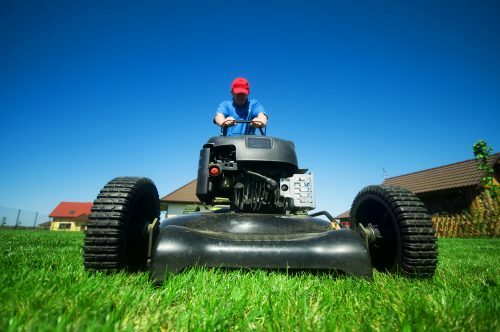 Since 2007, we’ve been providing a host of lawn care and maintenance services to homeowners, including mowing and trimming, edging, pesticide application, shrub care, tree trimming and more. Let us elevate your lawn to a brand-new level of health and beauty! Did you know, a good-looking lawn can increase the curb appeal of your home? A well-kept lawn is also better for erosion control, rainfall absorption and a whole host of other benefits! Simply put: it’s worth your while to keep a beautiful, healthy lawn. Unfortunately, not everyone has the time or tools to dedicate to their lawn. That’s where Tarheel Lawn Service comes in. Unlike other landscape companies in Raeford, NC that focus on all different aspects of your landscape, we focus strictly on the greenery: your lawn, shrubs, bushes and trees. Our crews deliver the care and maintenance services they need to stay healthy, vibrant and strong, so they can lend their many benefits to your property. Our approach to lawn care and maintenance is far from a one-size-fits-all approach. Instead, we take the time to survey your landscape and get to know the unique needs of your lawn. Then, we put together a plan that will result in a stunning landscape for your home! From routine mowing and trimming, to shrub care and tree trimming, to pesticide applications to protect your grass, count on us to deliver complete service. A healthy lawn and beautiful landscape aren’t accidents: they’re the result of hard work by lawn care companies in Raeford, NC like Tarheel Lawn Service! Let us raise the standard of your lawn to a whole new level. Unlike general landscape or property maintenance companies, we focus specifically on your lawn, to give it the focused attention it needs to grow lush and green. We have experience in managing commercial lawn and landscapes, making us supremely qualified to tackle your residential property’s lawn care needs. Our business is a Certified Ground Applicator, administering pesticides to your lawn to deter pests and protect the healthy growth of your lawn. We’ll be glad to discuss our full scope of services with you and tailor our approach around the unique needs of your lawn and budget. We offer free estimates on our lawn care services and offer $10 off your first appointment with us. Get the green grass, precision edging, well-kept shrubs and trimmed trees your property deserves! Contact Tarheel Lawn Service today for expert-level lawn care services.